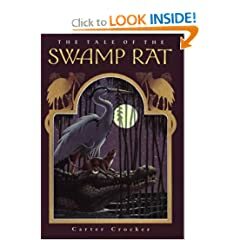 Grade 4-8-Crocker has created a realistic fantasy world, set in the swampland of Florida and populated with the animals that reside there. This timeless tale of an unexpected hero is narrated in a traditional folklore style by a mole who tells “every bit, just as it was. The rest I made up, as best I could.” Ossie is the runt of his swamp rat litter. When his parents and siblings are devoured by an evil rattlesnake, he escapes, and is surprised to find himself cared for by Uncle Will, a huge and ancient alligator. Will teaches him how to survive and trust himself, even imparting thousands of years’ worth of history available only through alligator memory in his dreams. From Will, Ossie learns about the Indians, runaway slaves, and the poachers who have inhabited the area. As the young rat gains self-confidence, he befriends turtles, birds, possums, armadillos, and especially a beautiful young swamp rat, Emma. As the seasons pass, the drought Click here to Purchase!